Our room and stay were perfect. The location is fantastic and the staff was phenomenal. The staff was vey nice and the room spotless clean!! Great location and view from upper floors. Valet parking fills up fast. All of the staff were friendly, helpful and thoughtful. Great value for such a nice experience and property. I like its location. It is close to the airport, and driving distance from nice restaurants. However, it does not have a bar nor a restaurant near by, at a walking distance. It is a good place if you plan to sleep. Had a wonderful stay at this hotel. Everything that one could ask was there. Look forward to returning to this location. Georgia's first city and arguably the ‘capital of the South,’ Atlanta is a city where you can spy a beluga whale or giant panda cub, delight in everything from fusion fine dining to a burrito from Sweet Auburn Curb Market, and learn about where the much-loved soda comes from at World of Coca-Cola. With its blend of Southern Yankee charm and dynamic style, Atlanta appeals to business travelers staying Downtown, but those who want to tour both Civil War and civil rights history can still have their fill with the Atlanta Cyclorama museum and Martin Luther King Jr. National Historic Site. Zoo Atlanta is home to well over 1,500 animals, set in the sprawling Victorian design of Grant Park, hence the animal attraction's original name of Grant Park Zoo. The biggest draw is often the resident pandas, though a varied line-up of everything from elephants to chameleons also brings in the family crowds. With the zoo sitting alongside Civil War museum Atlanta Cyclorama, guests can spend a whole day pleasing everyone in the family in Grant Park. Marvel at the wide array of marine life, activities and educational programs offered by the Georgia Aquarium on the north side of Centennial Olympic Park, and try to squeeze in a dolphin show if there’s time. Feel like getting out on the water yourself? Visit Lake Lanier around an hour north of the city, for a solo fishing trip or some family time around the bonfire. Head to the Fernbank Museum of Natural History to learn all kinds of fascinating things about dinosaurs and other prehistoric creatures. If you're more into contemporary art and photography, be sure to visit Ferst Center for the Arts. There's even a museum designed specifically for children: Children's Museum of Atlanta, with an emphasis on learning through colorful and creative workshops and play-zones. And don't miss the tempting tasting rooms at the World of Coca-Cola. Six Flags is where those with a healthy craving for thrill rides should go, though there are plenty of underage options for younger visitors. The Acrophobia is a freefall tower that you'll never forget; it's merciless but unbelievably fun. Aside from rides, Six Flags offers tons of restaurants, souvenir shops and games. If you need a break from the heat, head for White Water, a theme park filled with epic water rides guaranteed to soak you through and cool you down. You'll find a number of well-known sports teams in town, including the Braves, Falcons and Hawks. Make time for an exciting ballgame at the Phillips Arena. The basketball skills of the Hawks are also on display here, as well as international music and television stars that include the likes of Oprah Winfrey. Located approximately eight miles south of downtown, the HartsfieldJackson Atlanta International Airport (ATL) is the world's busiest airport. 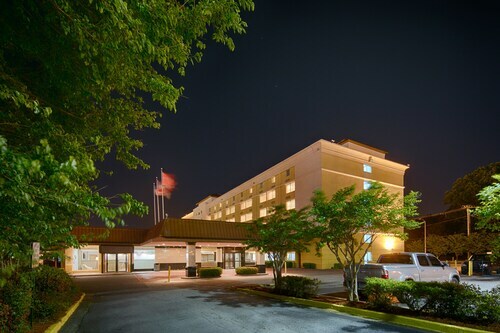 However, it is very accessible and within a mile you'll find numerous Atlanta hotels, including Marriott Gateway Atlanta Airport, the Days Inn Airport Best Road and the SpringHill Suites Atlanta Airport Gateway. If you're staying Downtown or in Buckhead, use MARTA rapid rail transport direct from the airport. 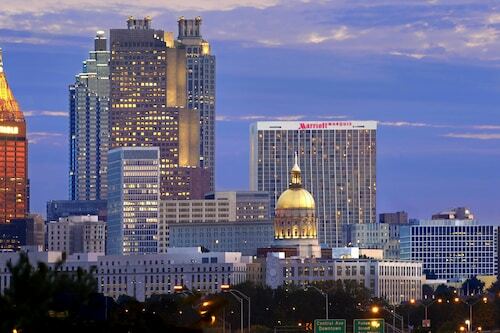 You can also travel to Atlanta and get around by train, with the national rail station at Peachtree Center and the Amtrak station at Peachtree Street N.W, allowing you to jump on and off the network of buses and local trains throughout the city. If you have the choice, plan your trip to Atlanta in late May. This time of year is summery without being too hot, and many concerts and other fun-filled activities get underway. The subtropical climate means that things can get humid here later in the year, with temperatures well into the 90s. Avoid thunderstorms and windier weather by coming in the relatively calm and dry autumn. It was a great place to stay. Had a good breakfast and a reasonable price. Very quiet and peaceful. Staff very kind and helpful. Location was excellent. Within walking distance to many attractions and restaurants. Bathroom was very small-could not have 2 people use it at the same time. The concierge service was excellent-they steered us inthe right direction many times and there was always someone there to help you. On the other hand, if you called "O" from the room, you never got anyone. Luckily we didn't need anything important.